The lives of Chester Adgate Congdon and Clara Hesperia Bannister converged in 1871 at New York’s Syracuse University, where each had enrolled as freshmen in the college’s first four-year class. Both excellent students—and both the children of Methodist ministers—Chester and Clara graduated Phi Beta Kappa, and Clara was among the first seven women to graduate from the school. They also found time for romance and had become a couple by the time their course work ended. They postponed marriage until Chester established himself professionally. Born in 1853 in Rochester, New York, and raised in Corning, Congdon found himself the patriarch of his family at just fourteen years of age after one tragic month in 1868 saw three siblings die of scarlet fever and his father taken by pneumonia. Chester assumed responsibility for looking after his mother, brother Albert, and sister Laura. The young Methodist was not afraid of hard work—he had English Quaker roots and his family had been seventeenth-century settlers of Rhode Island. He remained in Corning, taking a job in a local lumber yard and rooming with the Heermans family, friends of his parents who had a son, Harry, about Chester’s age. The two would become lifelong friends. Meanwhile, Chester’s mother moved with his younger siblings to a small farm she purchased in nearby Ovid. Clara didn’t have such worries. A native of San Francisco, California—and one year younger than Chester—she grew up the daughter of Edward Bannister. Edward and his wife were both born in upstate New York of colonial stock and English heritage, and by 1844 he was the minister of a Methodist church in Syracuse. (Clara may well have chosen Syracuse, then a Methodist institution, in part because of her family’s connection with the community.) Edward moved his family to California a few years later, and in 1851 he became one of three Methodist ministers who founded California Wesleyan College at Santa Clara, California (the college has since evolved into the University of the Pacific). At the time, the Methodist church considered education a necessity to help people live meaningful lives, a philosophy both Clara and her future husband maintained throughout their own lives. No one realizes better than I that there is no reason why anyone should wish to share my life; & so when I think of how poor my own prospects are; & that there may be some doubts in your own mind, I very naturally think of the wilderness. For I should never have come here had it not been for you—& I would not stay here a week were it not for you. Not that I would go & kill myself; as that would occasion unpleasant notoriety—nor deliberately throw myself away. But I have become something of a gambler in feeling. I would risk everything on a small chance—go into the territories after money and in all human probability fail. Here is a slower & safer course…. I have seen a good many poor lawyers make money, so I may make some someday. Chester Congdon’s prospects changed dramatically after he met William Billson, the U.S. District Attorney for the State of Minnesota. The two hit it off immediately, and when the position opened, Chester went to work as Billson’s assistant, receiving a small pay raise along the way. Billson left for Duluth, but Congdon stayed on for three years. After borrowing several hundred dollars from Harry Heermans, Chester wrote to Clara, asking her to start planning a wedding. On September 29, 1881—ten years after they met—Clara and Chester were wed in a small ceremony at Syracuse. The Congdons honeymooned at Niagara Falls. Chester and Clara settled in St. Paul—at first in modest boarding house rooms and then at 65 Wilkin Street in Irvine Park—and immediately began raising a family. Walter Bannister Congdon, the first of seven children, was born in St. Paul in November 1882. The following May the Congdons took up residence in the lower half of a duplex at 325 South Franklin Avenue, where their second son, Edward Chester, was born in May 1885 and their first daughter, Marjorie, came into the world in January 1887. The family moved again the following year, to 546 Selby Avenue on a bluff overlooking the city, and in February 1889 Chester and Clara added Helen Clara to their brood. Another child, John Robert, was born in May 1891. Life in St. Paul for the Congdons was punctuated by frequent visits from Chester’s mother and brother as well as Clara’s family, particularly her sister Mary, and Chester’s old friend Harry Heermans. Reverend Charles W. Bennet, who had officiated over the Congdons’ wedding ceremony, traveled from Syracuse to baptize Edward, Marjorie, and Helen. Bennet’s brother Bill, another close friend, actually lived with the Congdons for almost two years. Clara’s diary is filled with the notations of a mother, such as each child’s first words (one of Walter’s was “kitty”) and every mother’s worry: childhood diseases. Edward brought home measles to his siblings, Walter passed on his chicken pox to all, and Helen spread whooping cough through the house. Chester maintained his job as Assistant U.S. District Attorney until 1884 when he quit to start his own firm. For the next six years, Congdon’s client list expanded rapidly. As his family and wealth grew, Congdon found opportunities for travel and became interested in western mining stock; he even visited Butte, Montana, where he invested in the Gold Flint copper mine. He also traveled to the Pacific Northwest in 1887. Congdon and Harry Heermans purchased land along the Puget Sound to develop as Grays Harbor. Congdon also acquired land in Yakima Valley he hoped to develop for agriculture. His work travels also brought him frequently to Duluth, then a booming metropolis. There he visited his old friend William Billson, who had moved to the “Zenith City of the Unsalted Seas” in the mid-1880s and had established a very successful private practice of his own. Billson spoke excitedly about the city’s future and suggested that Congdon move to Duluth and partner in his legal practice. 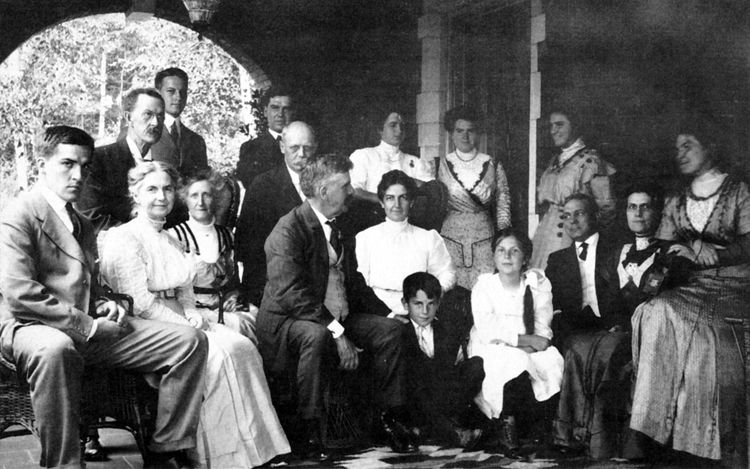 Congdon accepted, and in 1892 the Congdon family moved to Duluth. Chester headed to Duluth before the rest of the family, who arrived on May 17. They moved into a house at 1530 East First Street. The firm of Billson & Congdon quickly earned a statewide reputation for its expertise in civil litigation. The Congdons also suffered a major loss. John Robert, two days shy of his second birthday, died in May 1893 of scarlet fever. In April 1894 Clara gave birth to the Congdons’ third daughter, Elisabeth Mannering. Two years later the Congdons purchased a home of their own: the “Redstone” at 1511 East Superior Street. Faced in red Lake Superior sandstone, the three-story Victorian master-piece had been designed by renowned Duluth architect Oliver Traphagen for his own family. The following year the Congdon family grew unexpectedly when Clara’s recently orphaned nephew Alfred Bannister came to live with the Congdons. Robert, the last child born to the Congdons, arrived in September 1898. By then most of the older Congdon children were already spending part of the year at East Coast boarding schools, and Walter would soon begin attending college at Yale. While working for Billson in 1892, Chester Congdon had met and become business partners with Henry Olive, owner of Pittsburgh’s Oliver Steel. The two formed the Oliver Mining Company. From the mid to late 1890s J. D. Rockefeller, Andrew Carnegie, Henry Oliver and Chester Congdon battled over ore rights on the Mesabi Iron Range. Fearing the ongoing battle would destabilize the national economy, J. P. Morgan stepped in and formed U. S. Steel in part by buying out Rockefeller, Carnegie, and Oliver Mining’s holdings. By 1904 the Congdons had finally achieved Chester’s dream of being “better off than everybody else”—in Minnesota, at least. Perhaps only railroad magnate James J. Hill had more money. Chester retired from practicing law that year, and he and Clara decided to build an estate befitting their position. The house, called Glensheen, was completed in 1909. When he could tear himself away from the house project, Chester tended to his investments. At Yakima, Congdon Ditch was improved and Chester developed half the land he owned adjacent to the canal into Congdon Orchards. The next year, ground was broken for Westhome, a castle-like mansion that would become the Congdon family’s second home. Iron and apples weren’t Chester’s only business interests. In 1901 Congdon joined Thomas Cole, former president of the Oliver Mining Company, and others to create the Calumet & Arizona Copper Company at Bisbee, Arizona. Other investors included C. D. Fraser, president of U.S. Steel, and former Duluth mayor Charles D’Autremont. The company later expanded into Ajo, Arizona. When a plan arose to increase state revenue by applying a tonnage tax on ore mined on the Iron Range and shipped out of state—with the income distributed statewide—Chester Congdon stepped into action. He saw the tax as a threat to both St. Louis County and his own pocketbook as well as those of his business associates. He didn’t mind a tax if the money stayed local, but he was against spreading it to non-iron-mining municipalities. The bill failed, but its promoters intended to take it up in the 1909 legislative session. So Congdon ran for office as the Republican representative from Minnesota’s Fifty-first Congressional District in 1908—and won. As expected, the tax amendment was reintroduced to the 1909 legislature. Despite the efforts of the Congdon-led “Duluth Delegation” to kill it, the bill passed the House. The Duluthians lobbied hard again, but the bill passed the Senate as well. It only needed Democratic Governor Johnson’s signature, and he had once lobbied on behalf of the tax. Surprisingly—citing a threat to the development of Northeastern Minnesota and questioning its constitutionality—Johnson vetoed the law. In Duluth, with Chester off on his own or the state’s business much of the time, Clara ran the estate. It is often said that Clara would not allow the drinking of alcohol nor the smoking of tobacco. This would go well beyond the restrictions of her Methodist background—at the time, while the church did ban playing cards, dancing, or attending circuses or the theatre (until 1924), it did not prohibit drinking alcohol or smoking. One family story has it that Chester kept brandy hidden in the mansion’s lower level for his male guests; it ends with Clara clearing the house of alcohol shortly after Chester’s death. These tales may well be exaggerations. Keep in mind that both the first and third floors of Glensheen included designated smoking rooms, and when Helen reached “marrying age” Clara held dances to introduce her daughter to eligible young men. In the carriage house attic, a clubroom was set aside for the male staff to unwind with beer, cigarettes, and poker. As a state legislator, Congdon voted against statewide prohibition for Minnesota. Congdon served as a representative again in 1911 and became heavily involved in a plan for legislative redistricting. He did not run again after his second term ended. Instead, he gave into wanderlust. In 1914, along with two old friends, Congdon visited New Zealand, Tasmania, Australia, Indonesia, China, and Japan. Along his journeys he purchased gifts for his family and kept a travel diary. His notes on that trip expose an interesting dichotomy in Chester Congdon: while he was apparently proud of his English heritage—it is reflected throughout Glensheen—he did not care for the English people. According to biographer Roy Hoover, to Congdon “the British were pretentious and considered all other nationalities inferior.” He considered the problem with England and the British colonies was that the English were lethargic, and he was disgusted that the English work day did not begin until eight a.m. He admired more efficient, nose-to-the grindstone cultures, like some he witnessed on his journey. “If the Englishman and those of his blood will not work for himself,” Congdon wrote, “he will have to work for more energetic people like the Germans, Japanese, or perhaps the Chinese.” Outside of those in Melbourne, Congdon thought, all Australians were “mentally as flat as a desert plain.” The problem? “To begin with, they are all English.” Those from his ancestral homeland could do no right in Congdon’s eyes, not even build a boat. “No man should ever take a British ship if he can get a Dutch, German, Japanese, or Austrian,” the Duluthian claimed, “or if he can swim to his destination.” Congdon’s mother’s family, the Adgates, were Dutch. When he arrived back home, Congdon turned to face a bigger issue. War had erupted in Europe, and he felt President Woodrow Wilson’s stance to keep the United States out of the conflict made the country look weak. He had been a supporter of former president Teddy Roosevelt, but thought the Roughrider shouldn’t have entered the 1912 presidential race and instead should have waited for 1916. In early 1916 Congdon was elected as chairman of Minnesota’s National Republican Committee. That February he addressed the Men’s Club of Duluth’s Methodist Episcopal Church, where his family attended services. His speech was entitled “Patriotism.” The talk essentially beat the war drum, laying the groundwork against Wilson and his antiwar stance. Late spring found Congdon in Chicago at the Republican National Convention, where he helped Supreme Court Justice Charles Evan Hughes of New York secure the party’s presidential nomination. On November 7, election night, Congdon was so confident that Hughes would defeat Wilson, he asked Glensheen’s cook to prepare a celebration dinner. Much to Congdon’s dismay, Wilson won. Life changed at Glensheen in the wake of Chester’s passing. Clara would honor her husband’s memory by wearing black for years to come, but she didn’t share Chester’s passion for the more formal aspects of the estate’s grounds. She allowed trees and brush to grow relatively unchecked, consequently transforming the estate by creating a more lush setting. Elisabeth dropped out of Wellesley to move back to Glensheen and take care of her mother. Walter, who married in 1914, was already out of the house. Both Marjorie and Helen would be wed before the decade was out, Marjorie to Chester’s business partner Harry Dudley, Helen to the son of Chester’s business partner Charles D’Autremont. Edward joined the service, returned, and wed in 1920. Robert was gone most of the year to prep school, then Yale. Alfred Bannister would attend college at MIT, but returned to Glensheen and lived there for most of the 1920s. Walter and Edward took charge of the family’s varied business interests and investments; Clara, with help from Elisabeth, took charge of the estate. They had held on to the Redstone and had it converted into a duplex, which they rented. In 1921, after a series of gardeners came and went, Clara and Elisabeth found George Wyness—and would never have to hire a head gardener again. Clara stayed active with Duluth’s First Methodist Church. Her daughters volunteered their time for various causes. The Congdons enjoyed the good life. Walter, Edward, and Robert were members of Duluth’s exclusive Kitchi Gammi Club (Edward was once its president) and Northland Country Club. At Glensheen the family played tennis, lawn sports, and enjoyed many visitors. Robert was married on the estate in 1922. Elisabeth, who never married, remained on the estate with her mother, who died in 1950. Edward Congdon died in 1940, the first of the Congdon children—outside of infant John in 1892—to die. Elisabeth outlived the rest of her siblings, killed by an intruder on June 27, 1977 along with nurse Velma Pietila. See the People index in the Zenith City Press History Archive for a biography of Elisabeth Congdon. 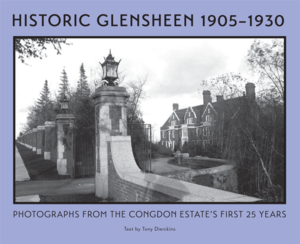 Glensheen: The Official Guide to the Historic Congdon Estate, contains brief biographies of each of Chester and Clara Congdon’s children. From Historic Glensheen, 1905–1930: Photographs from the Congdon Estate’s First 25 Years by Tony Dierckins (Zenith City Press, 2015) featuring 115 historic photographs. Click on the cover to preview the book.